Led by our fantastically enthusiastic choir leader, Clare. We welcome ALL voices and sing all styles of music. See our choirs performing here at the Manchester Jazz Festival 2014! 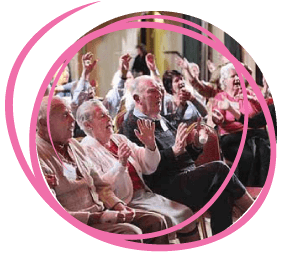 The Vibrant Voices Choir, launched in March 2011, is for people living with dementia, Parkinson’s disease, stroke survivors and their carers. 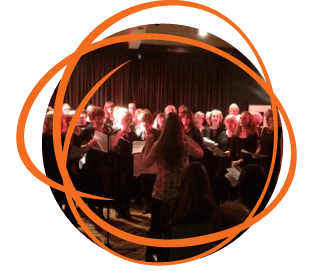 The choir is run by Clare Morel, with pianist Olly Hamilton with the support of The Music Place, the Cinnamon Club and the Alzheimer’s Society. The choir meets every Wednesday from 2-4pm at The Cinnamon Club, Bowdon. There is a cafe area and support workers from the Alzheimer’s Society to talk to. The hour long singing session starts at 3pm. The choir recently performed at Sale Waterside Arts Centre. Thank you to our volunteers from The Music Place daytime choir for their continued support.